To be fair, the show/tour/album are all billed as David Byrne & St. Vincent, so it would have been naive to think that this was just a Byrne show. Before it started, an older gentleman next to me explained that he hadn’t seen Byrne in a while, and hasn’t yet listened to the new album. I got the feeling that many in attendance hadn’t either. Having listened to the record a few times through before the show myself, I can tell you that they did it justice. With an eight-piece brass band that very well could have been plucked off the streets of New Orleans, the funky, intricate weirdness of the album was realized perfectly from the opening notes of “Who” through the closing of “Outside Space and Time”. From sousaphone to bass clarinet, the lively musicians had every sound covered, and managed to stay active throughout the show, marching in line during “I Am an Ape” and bringing to mind West Side Story in the introduction to St. Vincent’s “Marrow”. With only eleven songs on their album, there was plenty of room left for surprises. Admittedly, I am not at all familiar with St. Vincent’s solo work, and her songs fell a little flat for me. When she played “Cheerleader”, the band all laid down on the stage around her, prompting the majority of audience members to take their seats as well. While there is no denying that she has a good voice and can shred the s*** out of her SG, it seemed strange to see these songs being played while a legend danced silently across the stage. When it was his turn, on the other hand, everything changed. “Strange Overtones”, from his 2008 collaboration with Brian Eno, is a personal favorite and was a pleasant surprise early on in the show (see video below). Just four songs later, the band dropped from the aforementioned “Marrow” into the Talking Heads’ classic “This Must Be the Place (Naive Melody)”. “I feel like I’m 50 again!” exclaimed the guy next to me as he jumped to his feet. These moments, few and far between, were what the majority of people had come to see, and you could tell just from a quick look around. During these songs, we were transported to a different place altogether before being brought back to Earth with more of the good-but-not-great Love this Giant. That trend continued throughout the show, and even into the encore. Upon returning to the stage, Clark went into a fairly lengthy story of hearing the Talking Heads’ “Burning Down the House” in Revenge of the Nerds when she was three or four years old, and how she would have never believed that she would get to play with David Byrne, and so on and so forth. After several minutes of getting everyone primed for “Burning”, she launched into her own “Cruel”, aptly describing the collective case of musical blue balls she had just given the capacity crowd. Finally, though, it arrived. Every part of the night had been meticulously planned out, and this was no exception. The arrangements on “Burning Down the House” were fantastic, with the horn players adding layers to the song that I had never heard before. As soon as it started, though, it seemed like it was all over. 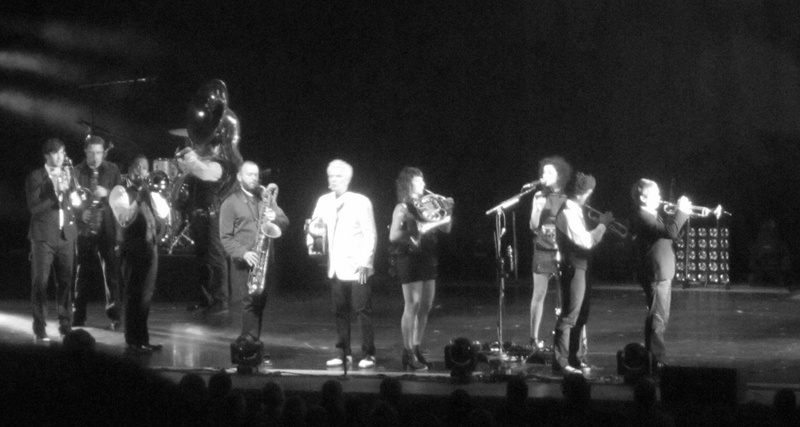 The pattern would repeat once more, with the second encore consisting of St. Vincent’s “The Party” followed by the Talking Heads’ “Road to Nowhere” to end the night, with the band marching off stage while still playing their instruments. The circus was leaving town. Was it a good show? Undoubtedly. Would I see it again? In a heartbeat. Could it have been a little more balanced? I think so. 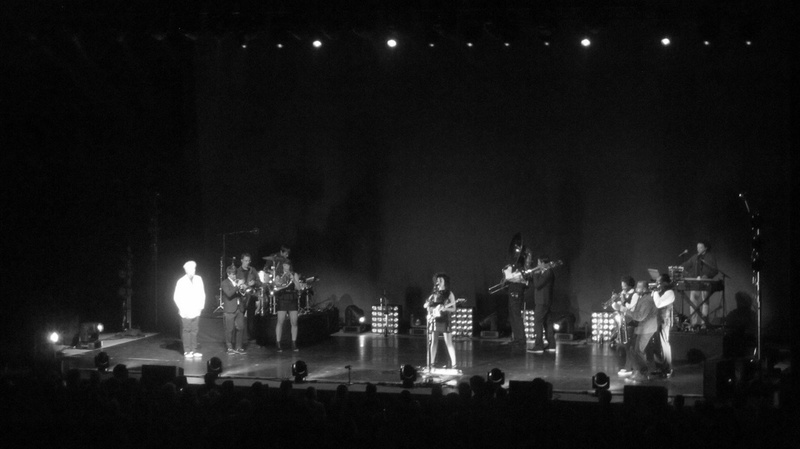 While on paper the show seems pretty evenly divided, the fact is that St. Vincent’s pretty but somber songs and stories somehow managed to overshadow the larger than life David Byrne and the dance party that most in attendance were expecting. To his credit, Byrne’s voice was pristine and moves were worth the price of admission alone. It was a fun night, and though the high points were as high as any I’ve experienced, I still left wanting something more.